My friend John has a nice Eddy Merckx titanium bike. It was built by Litespeed if I remember correctly. It’s a really fancy bike, but it’s seen a lot of miles and needs a bit of a makeover. One of the things John was concerned about was the longevity of the original fork. The item in question was made by Time out of carbon fiber, sometime in the early to mid 1990s. It was without a doubt top-of-the-line and quite expensive when it was new. That was almost twenty years ago though and it’s a bit dated at this point. We decided to replace it with a steel fork that will undoubtedly last as long as the frame. There are lots of options when one is building from scratch, so John opted to get Schmidt SL dropouts. If he ever decides to use the bike for a summer (dry weather only) brevet, a dynamo hub can be fitted and the electrical connection will automatically be made by a contact plate in the right dropout. He’s also had some injuries and surgeries that mean he needs the handlebar a little higher than he used to, so we left the steerer tube a bit longer than the original. I’ll put in 20-30 mm of spacers between the locknut and the adjusting cup when I reassemble the bike, the extra steerer will support the technomic stem nicely. 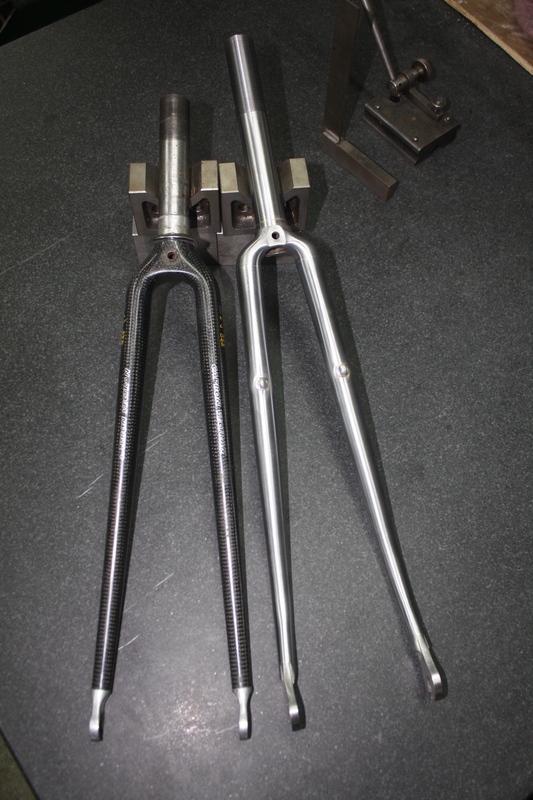 Old fork on the left, new fork on the right. More photos here. That was the side project, now for the progress report! Awhile back, I wrote a post about making lugs, but all I had to show was a couple of lug sockets. They represented a fair amount of work, but really, they weren’t much to look at. It looks like a bike now, although there is still quite a ways to go- in addition to a few more braze-ons and some finish work, I need to make racks and a stem. Seat lug close-up. Extra seat tube will be removed later. Still has a ways to go, but coming along nicely! 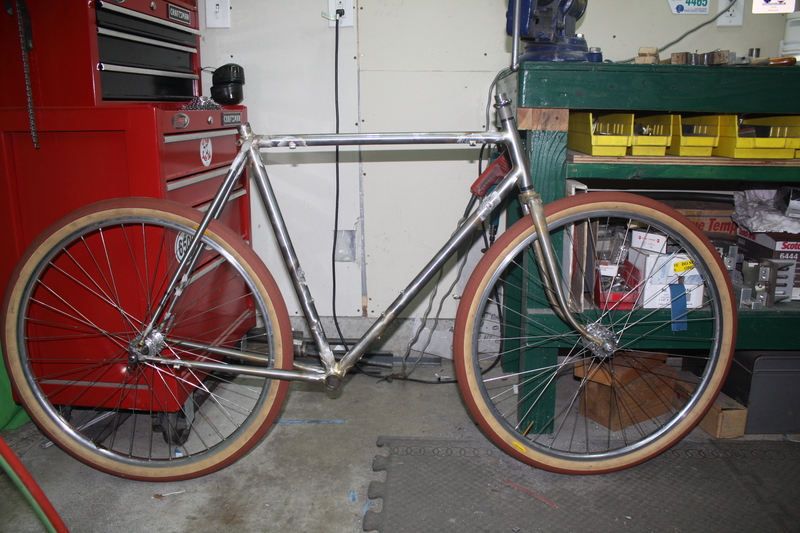 This entry was posted on December 15, 2012 by Thompson Custom Bicycles. It was filed under Uncategorized .